Franui celebrate their twenty-fifth year – a welcome occasion for an anniversary album, with many guests and fellow travellers, some new pieces, some old but previously unreleased recordings, and some of our greatest musical moments from the past quarter century, including tracks from albums that have been out of print for years. The rest is history: The musicbanda is named after a mountain pasture located some 2,300 meters above sea level, near the small village of Innervillgraten in the south of Austria. The memorable sound of their music is created from wood and brass instruments and plucked and bowed strings. From the funeral marches that first earned them popularity outside their native province the band inevitably proceeded to the dance floor. Located somewhere in between these two poles are their highly original “appropriations” of Romantic lieder, with Schubert as their patron saint. And so the journey continues – from the abandoned hayloft at the head of the valley to Europe’s major festivals and venues. Franui is a mountain pasture. Sure, smiles the aficionado, you mean the mountain pasture with the same name as that funky band from East Tyrol. The one with the harp, the dulcimer, lots of brass and a tendency to overdose on Schubert. Have they really already got their own mountain pasture? What do you mean by “already”? We’re talking about eight musicians who have performed under this name since 1993 right up to today without any interruption (there are now ten of them). So much activity deserves to be rewarded by the mayor. 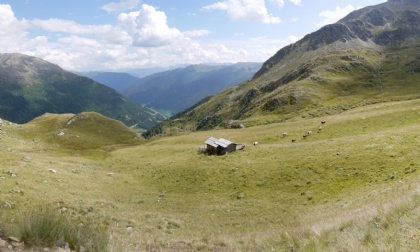 Admittedly, the pasture is a bit remote, at 2,300 metres above sea level, up above Innervillgraten. That’s a place in Villgratental, one of the valley communities inhabited by idiosyncratic locals not far from Lienz – but not too near to Lienz, either. Gustav Mahler had a house near there where he composed music. The local inn is called Raiffeisen. And the overdose of Schubert is because Franui played funeral marches for a long time at first, until they realised they could switch to Schubert without losing any impact. What do Schubert and funeral marches have in common? It’s like this: sometimes Schubert as played by Franui really does sound like brass band music. For example, the tuba exerts pressure from below, and things start moving up above. The trumpets pound. The saxophone rolls, the clarinet squeals, then it all breaks out into a sweat, like on the dance floor. And then it’s suddenly quiet. Just a floating chord from the harp, maybe the double bass allows itself a cultured plong-plong. Then the voices begin. At full power, of course, and what for a moment at first distantly recalls the Raiffeisen inn after the third round of beer suddenly consolidates into a seraphic soaring, into a melodious harmony of the finest, most transparent substance. But just as you begin to hear the Schubert you’re familiar with, and you think you’ve seen through to the artful, sensitive nature of the band, the noise breaks out again, wummta, wummta, and the brass band shows Schubert how to really shake his booty. Is it always just Schubert? Back in 2009, while working on some of Haydn’s dances for Radio Ö1, we came across an album entitled “Creampuffs from Vienna.” Eventually we decided to knead several German Dances and minuets plus one Scottish song by Joseph Haydn into a dough, and when the pastries came out of the oven we chose the same name for them: creamy delicacies from Vienna. What better start for an anniversary album than this original release? Rhythmically it starts as a funeral march, yet it ends on the dance floor. Where else. Franui is the name of a mountain pasture close to the small village of Innervillgraten, located at 1,402 meters above sea level in East Tyrol in Austria, where most of the Franui musicians grew up. The word is of Rhaeto-Romanic origin and refers to the proximity of Innervillgraten to the Ladin-speaking region in the Dolomite Alps. The Musicbanda of the same name have been playing together in nearly the same lineup since 1993 and are frequently invited to perform at major festivals and venues (e. g. Wiener Konzerthaus, Vienna Burgtheater, Salzburg Festival, Stiftung Mozarteum Salzburg, Tiroler Festspiele Erl, Bregenzer Festspiele, Ruhrtriennale, Radialsystem V Berlin, KunstFestSpiele Herrenhausen, Ludwigsburger Schlossfestspiele, Münchner Opernfestspiele, Philharmonie Köln, Elbphilharmonie Hamburg, Philharmonie and Grand Théâtre Luxembourg, Les Nuits de Fourvière Lyon, Holland Festival). Franui are best known for their adaptations of lieder by Schubert, Schumann, Brahms and Mahler. The ensemble regard themselves as a “transformer station between classical music, folk music, jazz and contemporary chamber music;” sometimes the original is lovingly celebrated in all its beauty, at others it is turned upside up (or down), stripped down to its bare bones, enhanced, painted over, elaborated, in a process that blurs the boundaries between interpretation and improvisation, between arrangement and (re)composition. 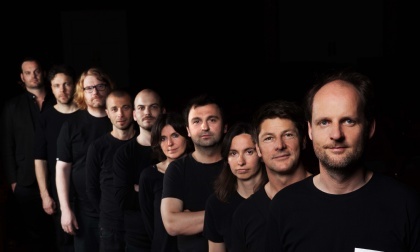 For their live shows and music theater productions Franui frequently collaborate with other exceptional performers: The program “Tanz Boden Stücke” (feat. Wolfgang Mitterer) premiered at Stiftung Mozarteum in Salzburg in 2014 and was released on the CD “Tanz! (Franz)” in February 2016. The Salzburg Mozart Week 2017 hosted the premiere of “Ennui. Geht es immer so weiter?” (feat. Peter Simonischek, scenery by Martin Gostner), an excursion into the musical cosmos of Wolfgang A. Mozart. The same year a new recital, “Alles wieder gut,” was realized in collaboration with bass-baritone Florian Boesch and Swedish artist Jonas Dahlberg. Their latest music theater production, “Wien ohne Wiener – Ein Georg-Kreisler-Liederabend,” a joint project with puppeteer and director Nikolaus Habjan, premiered at the Vienna Volkstheater in October 2017. On the occasion of their twentieth anniversary in 2013 the ensemble hosted a sensational concert in the original Franui mountain pasture, at 2,300 meters above sea level, and some 1,500 visitors embarked on a three-hour hike to reach the location. Since 2015 Franui are part of the annual festival “Gemischter Satz” hosted by Konzerthaus Vienna, which presents new forms of interaction between music, art, literature and wine. 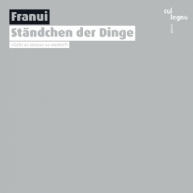 Franui’s albums are released with the label col legno since 2007 and have won several prizes (German Record Critics’ Award, Radio Ö1 Pasticcio Award, Toblacher Komponierhäuschen). Dance music from high-alpine regions and from the low plains, music located somewhere between Schubert, Bartok and a Young Farmers’Ball in East Tyrol.